I can’t believe summer is over. I started writing this blog back in June, the official start of summer time-wise but definitely not weather-wise. Our June was cold, grey, blustery and wet – in other words, absolutely miserable. July started off much the same and didn’t improve until the latter half. August has been fabulous but the hot, muggy, molten days soon cooled towards the middle. In my opinion, it’s already felt like fall for a couple of weeks now in Vancouver. I love fall. It’s my favourite season. The weather is usually gorgeous – sun-soaked days tempered by a crisp, invigorating bite in the air. The leaves start turning into lush earthy colours like golden yellow, blazing orange or jewel red. The sun dips a bit in the sky, its trajectory lower and less haughty than that cocky summer sun. The smell in the air is so distinct to autumn – it always reminds me of the end of lazy, hazy days and the ushering in of new, exciting adventures. Around this time, I’d be both excited for and apprehensive of the new school year. I’d look forward to seeing my friends on a regular basis again but lament the return of homework and endless boring hours spent learning stuff. I’d be mesmerized by back to school commercials, wishing for new school supplies like fancy cloth-bound binders with zippers and pockets, pencil cases with rad drawers that would pop out at the press of a button, and new sets of those awesome Mr. Sketch markers that smelled like fruit (the reassuring words “non-toxic” emblazoned across the front of the box so sniff away!). I loved getting that rare treat of a new pack of sharp Laurentian pencil crayons and taking a deep whiff of the intoxicating smell of wood. I’d covet new fall clothes but my family couldn’t afford to send me off with new digs every year. Kids in my day looked a hell of a lot different than kids today. I’d be decked out in a second (or third or fourth) hand sweat suit (sweat pants with matching sweat shirt, bedazzled with a glittering kitty cat or weird geometric shapes) in pastel colours like pink or blue. I’d push my giant plastic glasses up my nose each time they slipped, cursing the hideous things that I’d worn since the second grade taking up realty on half my face. I’d pull awkwardly at the hideous boy-cut my dad would give me in the basement of our house. Please, give me a bowl-cut any time over the hack jobs that were inflicted on me. I’d walk the ten blocks in the cool, sunny mornings, underneath row upon row of heady-scented trees towards my elementary school and then, as I got older, the same distance to my high school. I’ll always remember that special autumn smell in the air – it strikes a deep melancholy chord in my chest even to this day to catch a whiff of it. I spent 22 years of my life in school. It’s no wonder that this “back to school” feeling is so ingrained in me. While you couldn’t pay me enough money to re-enter the world of academia, sometimes, a teeny tiny part of my wishes I could when September rolls around. 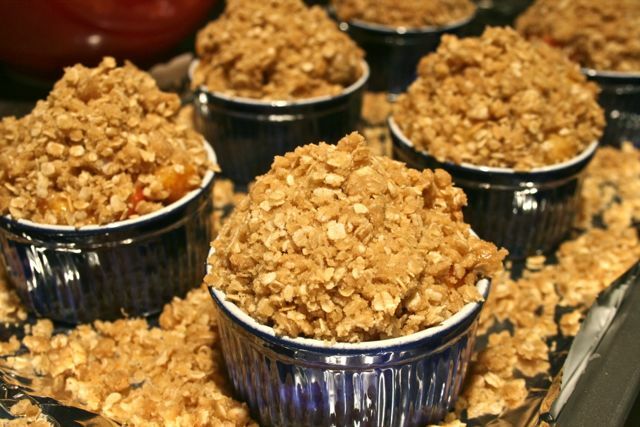 In honour of this transition period between summer and fall (and also my attempt at using up the cherries slowly decomposing in my fridge), here are cherry peach crisps (or cobblers, as the Husband proclaims them to be). 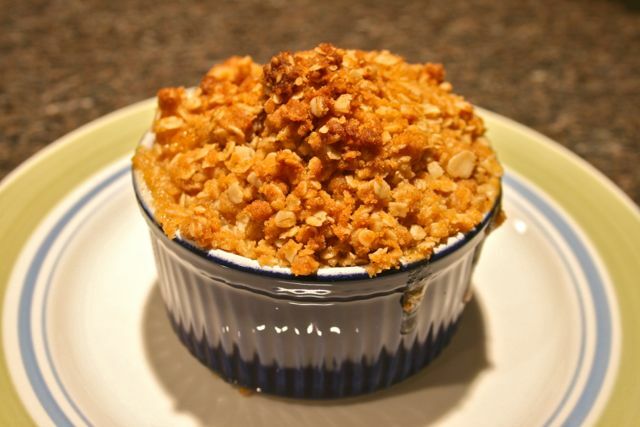 Thank you to my good friend, Alice, at Hip Foodie Mom for recommending I try this recipe. The original is found here at the Mini Baker’s blog. Wrap a cookie/baking sheet in aluminum foil. Place whatever you’re going to use to bake your crisps on top. 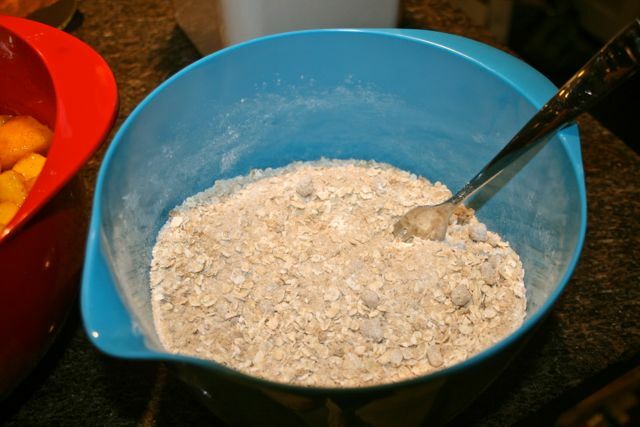 For the filling, mix everything in a large bowl and stir to coat evenly. Set the bowl aside. 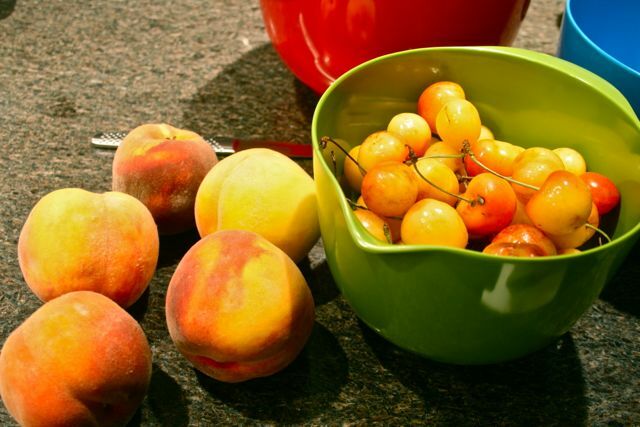 Beautiful Rainier cherries and fresh B.C. peaches. 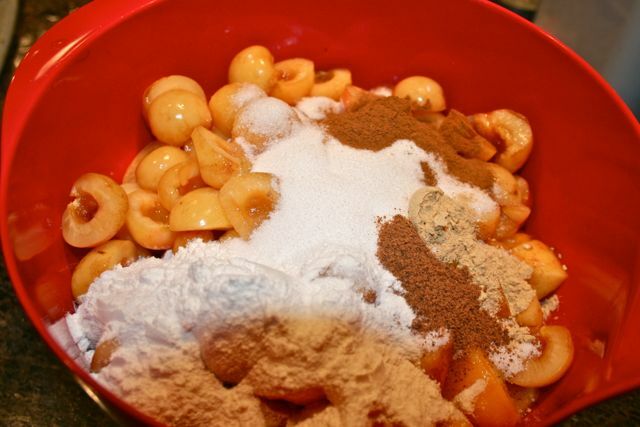 Throw in all the ingredients for the filling. 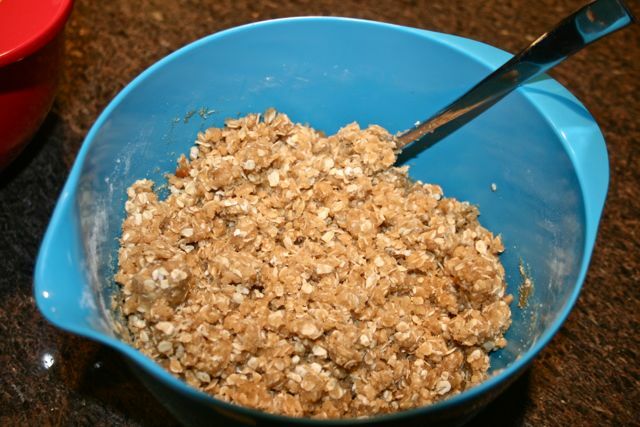 For the topping, mix everything in another large bowl. Slooowly pour in that hot melted butter. 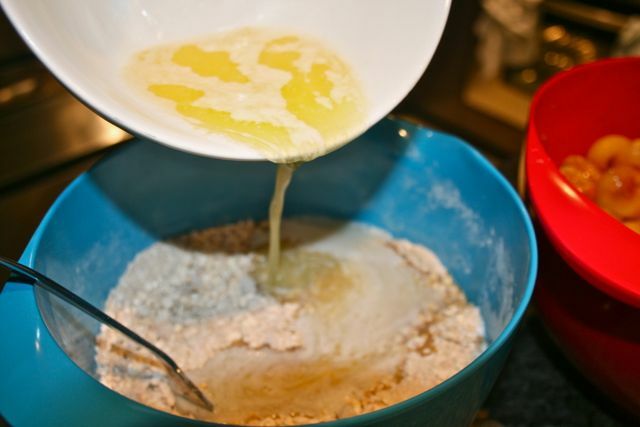 Spoon your filling (and as much or as little of the liquid accumulated in the bottom of the bowl) into whatever vessel you’re using to bake them in. 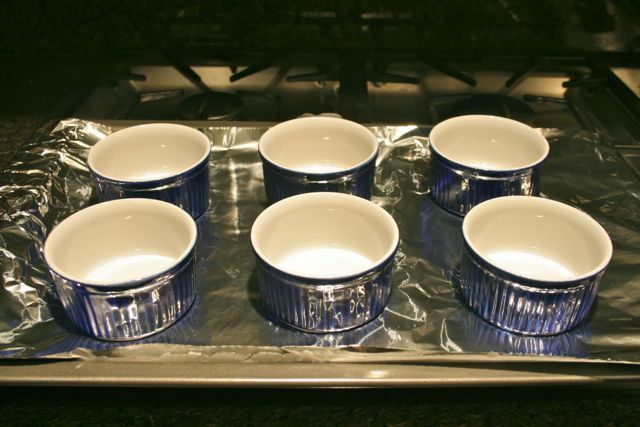 I used little ramekins, which were a bit too little as you can tell by my photos – I piled ‘em high! 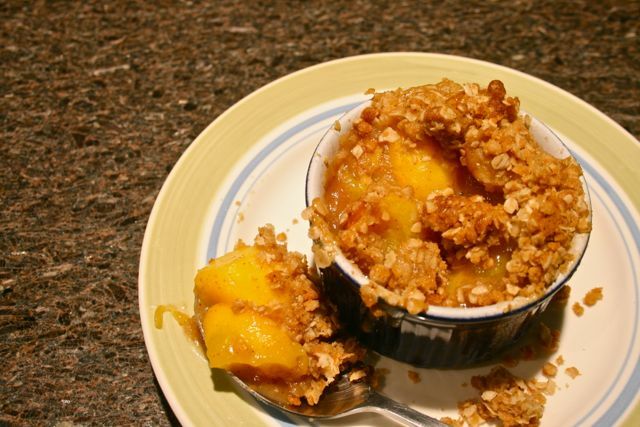 Top the fruit with as much of the crumble mix as you can get to stay. 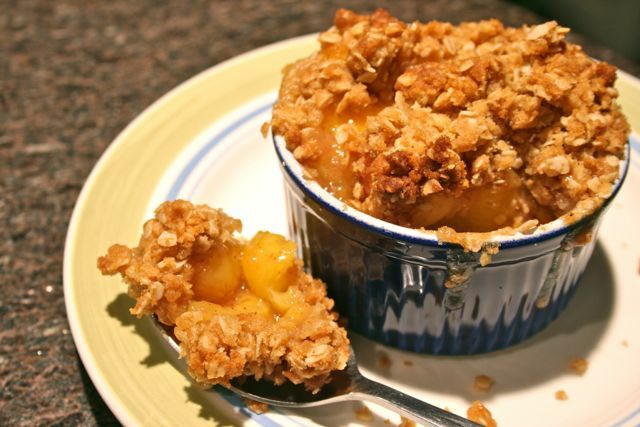 Seriously – the baked crumble topping is amazing. 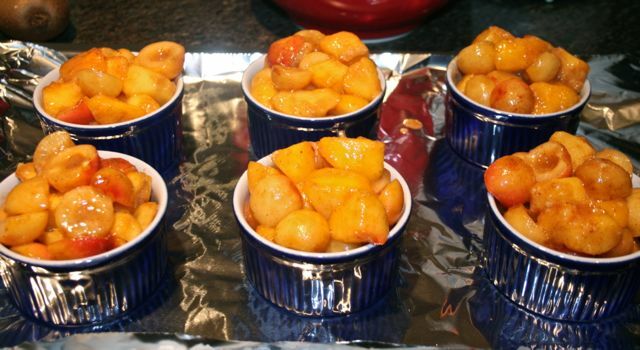 Bake for at least 40 minutes until the top is a nice golden brown and the fruit innards are bubbling merrily away. 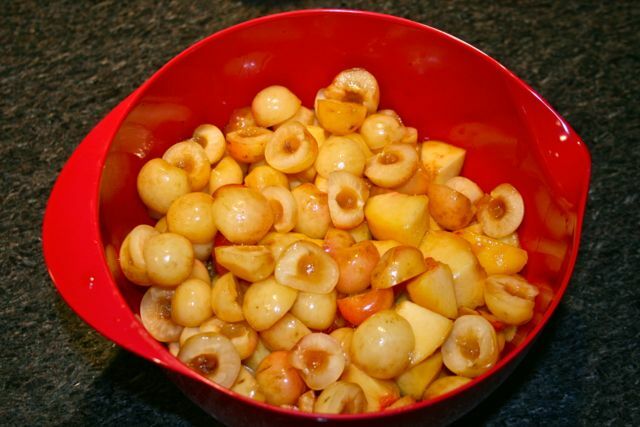 These babies filled my apartment with the sweet, syrupy aroma of cooking fruit and brown sugar. Even I can’t mess this recipe up. It was about 10:30 p.m. by the time these finished baking. Sure, it was my bedtime but that didn’t stop me from gobbling up a molten hot crisp. These are so good. The combination of cinnamon, nutmeg and ground ginger really complements the smooth, mellow sweetness of peaches and cherries. 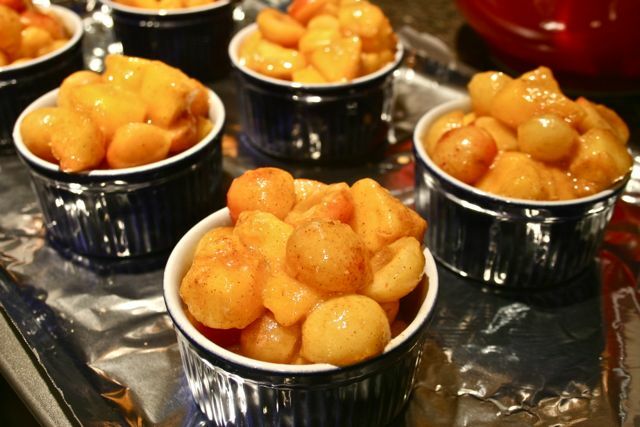 I don’t like fruit to be over-baked so I made sure not to leave them in the oven too long. Lo and behold – the fruit was perfect. They still held their shape and had a bit of resistance with each bite. 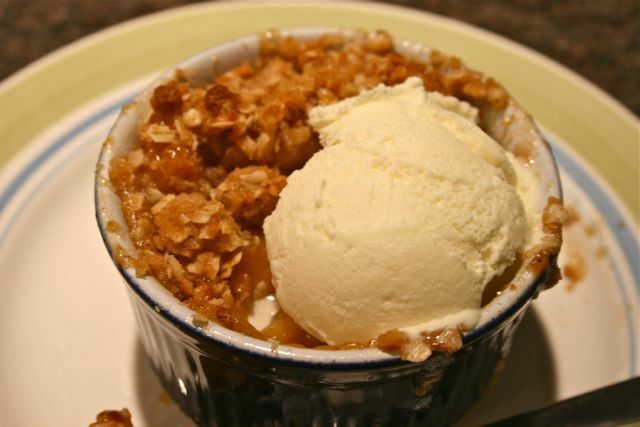 I have no words for how good the crumble topping is. 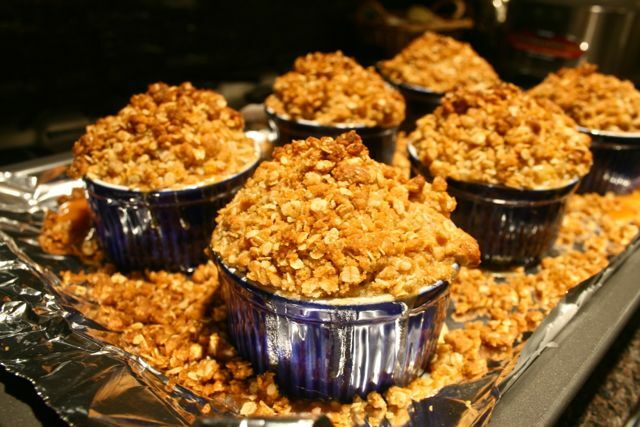 Crispy, buttery, with the prominent flavours of oat and brown sugar. Next time, I’m just going to bake and eat the topping. Who needs the side of fruit? Silly me – I started eating these before I realized there was something missing. Something very important and absolutely vital to my enjoyment of this dessert. Now that is comfort food. Perfect for the fall weather. Thanks, Mama! I totally agree. I’m looking forward to all the yummy fall and winter baking in the months ahead. OMG! They look so good! I could grab that last one with the ice cream! YUM! 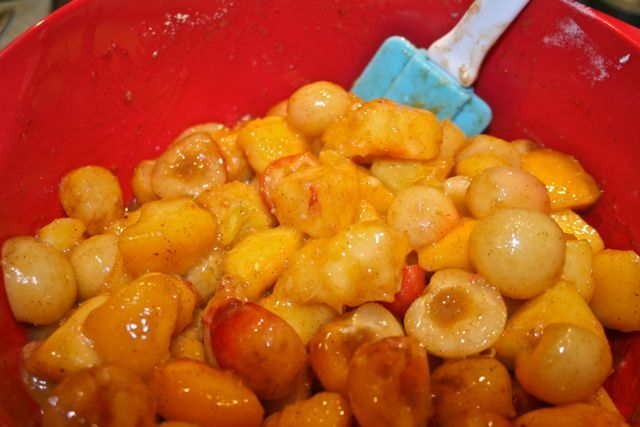 I love that you used cherries and peaches. . Thanks, Alice! I have you to thank for sending me the link to this recipe. It was delicious! And the cherries and peaches was a great combo. I don’t think so either! Now we can enjoy all the hot, decadent, cozy baked goods with the cooler weather. I hope your studies are going well! Yum, peach upside down cake sounds pretty darn tasty to me! I love reading your blog and all the stories. I nominated you for a Liebster Award! Aww, thanks Megan! I’m very honoured. Sorry it’s taken so long for me to respond – it’s been a crazy week and I haven’t been able to spend any time on my blog 😦 Hopefully it won’t take me too long to accept the award! Thanks so much, Sarah, for these super kind words. *blush* I really wanted to write what I felt and this is what I ended up with. If I could give up my day job and just bake ‘n write all day, I’d be in heaven!